Specifically, UVC bands, with an approximate wavelength measurement of 254nm, are applicable in eliminating common mold and harmful, disease-causing micro-organisms. 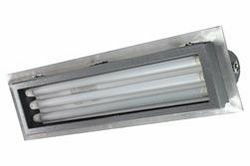 The effectiveness of UV LED lights for such applications heavily relies on the type of lamp, its position inside the AHU and basic maintenance practices. As numerous studies have already proven and cemented the use of UV LED luminaries for disinfecting AHUs, this article goes a step further by focusing on unique installation tips for optimized placement and thorough disinfection. Contrary to popular belief, not all filters are capable of fully eliminating microbes in AHUs. Most are designed to simply trap mold and other harmful substances in the air. Moreover, filters with anti-bacterial properties only kill microbes upon contact, which can be obstructed through the buildup of dirt and dust. UVC fixtures do not trap micro-organisms. The lamps work by administering a powerful beam, which targets the DNA of the microbe. During disinfection, a UV photon smashes through the cell wall and scrambles the DNA structure of the target. As a result, the microbe is unable to reproduce or infect other living organisms. In addition to clean air, UVC disinfection in AHUs provide a wide range of long-term benefits. By reducing microbial buildup inside the units, heat transfer and net cooling capacities are optimized. •	Surface Decontamination: This configuration focuses on disinfecting drain pans and cooling coils. During installation, operators secure the UV lamp on a mounting bracket, with the light directly targeted at the surface of the AHU components (downstream). According to Johnson Controls, the reflection of UVC beams within the chamber can boost kill rates significantly. Recommendation: Applicable to cleaning AHU parts and components. •	Airborne Inactivation: As the term suggests, this installation option targets airflow passing through the AHU. Such lamps can be positioned upstream or downstream, depending on the preference of the operator. It is important to consider that airborne inactivation requires more powerful UVC fixtures. This is because mold, fungi and other microbes are moving with the stream, resulting in less time for disinfection. Recommendation: Applicable to cleaning processed air. •	Surface Decontamination and Airborne Inactivation: For a thorough approach to AHU disinfection, it is possible to combine both methods mentioned above. Recommendation: Applicable to comprehensive disinfection, specifically for medical facilities, labs and etc. The American Society of Heating, Refrigerating and Air-Conditioning Engineers (ASHRAE) Handbook provides several technical recommendations on the use of UVC lamps in AHUs. According to the document, UVC fixtures are usually installed 12 inches from the target component. Irradiance levels will dictate the exact distance between the lamp and the component. For example, UVC lamps with 1,375 µW/cm2 output can be installed at a distance 12 inches. Lastly, the temperature inside the AHU, as well as velocity should also be factored in. These variables can reduce the effectiveness of UVC lamps. On the other hand, reflectivity rates on surrounding surfaces increase the performance of the fixtures.